Web Design Cheat Sheet - Portfolio | CyberBytes Inc. This is a FREE section which consists of every HTML4 and HTML5 element available with a short description an example of each. 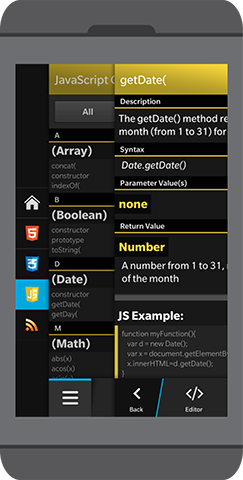 It has a built in editor which allows you to view and modify the example code in real time to help you better understand how the element works. Every element has quick links for additional information from well respected resources such as Mozilla Developer Network, WebPlatform, and W3Consortium. You are able to quickly filter between the different versions of HTML by pulling down at the top of the main list and selecting whether you want to see All, HTML4, or HTML5. 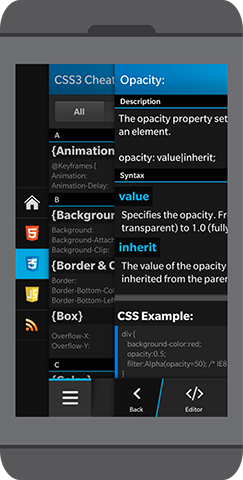 Included in the HTML5 section is a $0.99 unlockable which opens up a basic HTML Editor and the Resources Section. The resources section consists of video tutorials, step by step tutorials, and quick links to useful online resources. This is a $1.99 PAID section consisting of 176 CSS Properties, a Fully Functional HTML & CSS Editor, CSS3 Resources, and Quick Links Within Properties. Each property has a built in editor which allows you to view and modify the example code in real time to help you better understand how the property works. Every property has quick links for additional information from well respected resources such as Mozilla Developer Network and W3Consortium. The properties are conveniently broken up into categories for easy access. Text, Font, and Transform 2D/3D are just a few examples of the many well-thought out categories you can choose from. 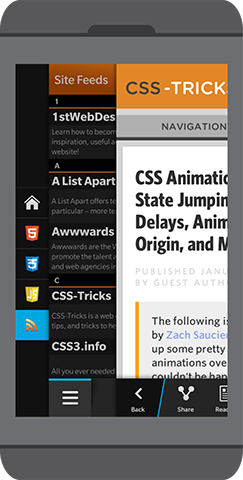 You are able to quickly filter between the different versions of CSS by pulling down at the top of the main list or each sub-category and selecting whether you want to see All, CSS1, CSS2, or CSS3. Every function has quick links for additional information from well respected resources. The functions are conveniently broken up into categories for easy access. Array, Boolean, and Date are just a few examples of the many well-thought out categories you can choose from. You are able to quickly filter between the different groups by pulling down at the top of the main list and selecting whether you want to see All, JS, Browser, or HTML. You can also do this within sub-categories and select between All, Properties, Methods, and sometimes Functions. This is a FREE section which consists of feed sources from dozens of well-respected online resources such as CSS-Tricks, Smashing Magazine, SitePoint, and much more. Included in this section is a very useful Reader Mode which puts content first and allows you to modify the size, color, and width of text in each article. Additionally there is a convenient Share button which allows you to instantly post an article that you just read to your favorite social platforms. Looking for something specific on the page? Try out the Find feature which allows you to search the page with case-sensitivity turned on or off to find exactly what you were looking for quickly. You are able to quickly filter between the different types of site feeds by pulling down at the top of the main list and selecting whether you want to see All, Design, or Development. The signature BlackBerry 10 experience. Built to keep you moving, apps and games with the Built for BlackBerry designation provide the seamless performance and integrated experience you’ve come to love. Look for the Built for BlackBerry badge to identify apps and games that deliver the signature BlackBerry 10 experience. This App is made by web designers, for web designers. Because of this, you can be sure that it has everything necessary to become an expert in this ever-changing industry. With a free HTML5 and Site Feeds section in the App, you get to try it out and decide later if you want to unlock the additional content. Built into the App is a very useful reader mode which allows you to put content first and customize your own personal reading experience for articles. Intelligently organized with productivity in mind, you can filter each section of the App between sub categories, such as CSS3, CSS2, and CSS1. With hundreds of syntax and properties, it makes finding exactly what you are looking for just that much easier. 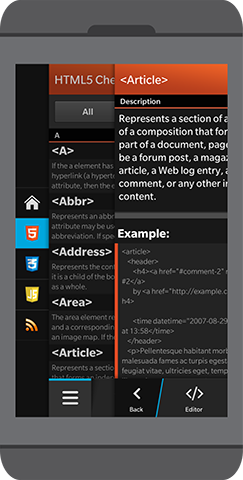 Web Design Cheat Sheet is the only App of it's kind on all of BlackBerry 10. It is the Built for BlackBerry Certified and highly requested on Android and iOS. The developer is committed on keeping it exclusive to the platform and bringing the best experience possible to you. 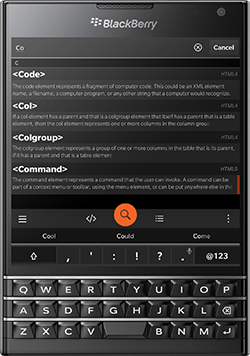 Using the Native Cascades experience of BB10, this is an App that will fit seamlessly on your device and you will be glad that you downloaded it.